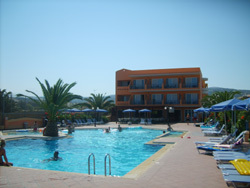 Platanes, 5km to the east of Rethymno, is an averagely-sized package holiday destination. Twenty years ago Platanes was an unremarkable suburb of Rethymno lying on the old Rethymno-Iraklio road. Then, thanks to the very long, beautiful beach, tourism arrived. It has really developed in the last two decades: luxury hotels such as El Greco and Creta Palace were built in the area. There are also the usual cheaper rent rooms and pensions in the centre. Though there’s nothing particularly special to see in Platanes or neighbouring Adele, holidaymakers come for the beach and for Platanes’ proximity to Rethymno. The busy main road which goes through the centre of Platanes is a bit of an eyesore, and serves to detract from the attractiveness of the village. The 8km beach which goes from Platanes through Adele down to Rethymno is one of the longest and best of Crete. The 8km from the eastern area of Rethymno (known as the ‘new town’) to Platanes and Adele is crammed with hotels, supermarkets, nightclubs, restaurants and all kinds of businesses catering to the whims and needs of tourists. On the website https://experthairextensions.co.uk you will find a large selection of natural Hair Extensions. A very good place to stay in Platanes is Apollon Hotel Apartments with mice studios and bigger holiday apartments for families. One of the advantages of Platanes is its excellent bus connections; in high season there is a bus every twenty minutes to Rethymno (about €1.30 in 2019). From there you can catch buses to all other parts of Crete. Platanes is not a bad choice for those seeking a traditional package holiday deal, but who also want to see Crete by bus. Plantanes has nothing special to offer apart from the beach. 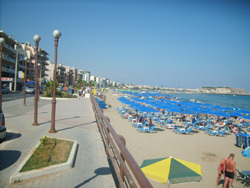 Those who like to walk can take a wide footpath along the waterfront to Rethymno (approximately one hour’s walk). Platanes beach is home to the eggs of the sea turtle (Caretta Caretta). 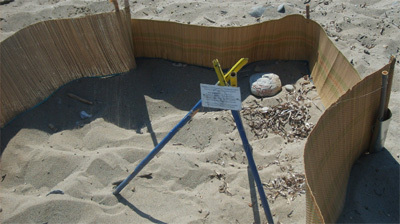 Their nests are signposted, and it is prohibited to go to the beach at night in summer, so as not to disturb the turtles hatching. The baby turtles find their way to the sea using the moonlight, and other lights (from a fire, for example) could cause a turtle to go astray. 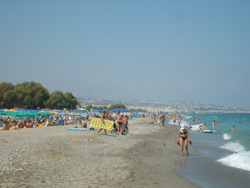 The longest beach on Crete Rethymno Beach ends in Platanes. There is a Lidl supermarket in Platanes. 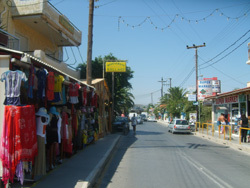 Because of the high prices of Cretan supermarkets, many foreigners living in Crete come to Platanes for their shopping. When you go east from Platanes along the sea after a few kilometres you reach Panormo, a nice village with beautiful beaches. Also the bigger resort Bali and the Cave Melidoni is in this direction.